Absolutely Cheesy: What Have I Been Working On? 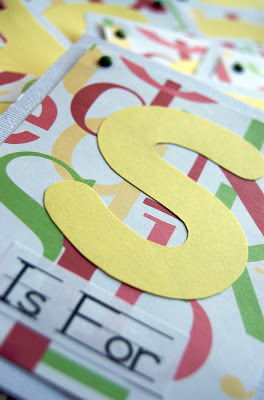 I've been typing, cutting, gluing, stuffing, sealing & addressing these invitations for an "S is for..." themed 1st birthday party. I couldn't be more excited. We will be dinning on sandwiches, salads, salsa (& chips), sweets, and soda. We will be playing Simon Says, I Spy, and Sock Mania. So if you are coming over be ready for a super fun soiree! I'm so doing this for Audrey! Such a perfect idea. What a great idea! I want one! bails, this blog is great. good work!